Tuesday (August 14), British Columbia officially had the worst air quality in North America, thanks to smoke from the over 560 wildfires burning across the province. In Vancouver, the Air Quality Health Index (AQHI)—with 1 being the lowest health risk and 10 being the highest —sat at 8 (high risk) from 11 a.m., when an air quality advisory was continued for all of Metro Vancouver and the Fraser Valley, due to the health risk posed by wildfire smoke hanging over the region. By 6:30 p.m., the AQHI had fallen to 6 (moderate risk) but the air quality advisory was renewed all the same. However, if the smoke does irritate your throat and/or make you short of breath, but you still have to be active outside, don’t worry, there’s a mask for that—just not the one that you always see some people in Vancouver wearing. Tuesday I saw two cyclists in Fairview wearing snug-fitting pollution masks and two pedestrians wearing what were either paper surgical masks, or the gauze variety. The former really will protect your lungs but the latter is utterly useless. According to the Metro Vancouver air quality advisory, the problematic fine particulate matter in wildfire smoke consists of airborne solids or liquid droplets with a diameter of 2.5 micrometres (µm) or less. Good cycling pollution masks, with HEPA-type, activated charcoal filters, are designed to block particles as fine as 0.99 µm and can also absorb the toxic gasses in the smoke, such as carbon monoxide, formaldehyde and acrolein. These masks start at about $80. 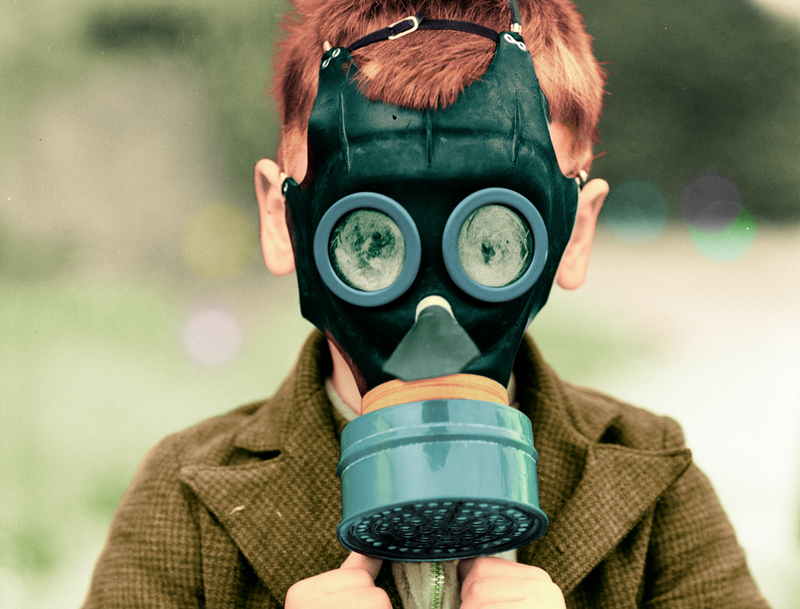 Actually, as air pollution increases around the world, pollution masks are increasingly not just for cyclists. A number of startups, like Sweden’s Airinum are bringing new, fashion-conscious, “urban breathing masks” to market. 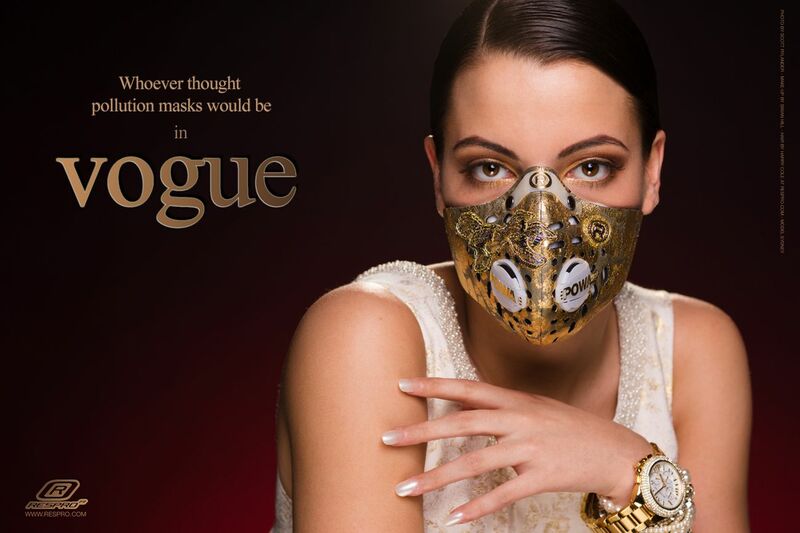 And long-time cycling pollution mask makers, like Respro, have added masks aimed at urban pedestrians and the ability to personalize masks with fashionable skins. A slim, lightweight pollution mask may be a practical long-term investment for a Vancouverite, given that periods of wildfire smoke are becoming an annual summer occurrence (in three of the last four years certainly). Remember, last August, thanks to the worst-ever wildfire season on record, Vancouver air quality compared poorly with Beijing, China! Another kind of face mask that you can run out and buy that will give you some real protection from wildfire smoke is a respirator mask labeled “N95” or “N100,” according to information on the subject from the Washington State Department of Health. The reusable variety start in the $50 price range (not counting the pricey replacement filters). Inexpensive disposable N95 respirator masks are available at most hardware and home improvement stores and large pharmacies and will filter‐out the fine particles of wildfire smoke but not the hazardous gases. These are generally sold in multiples. Unit prices I found in Vancouver stores (before taxes) ranged from $1.44 to $4.75. Ideally, disposable N95 respirator masks are only expected to last a workday but extended reuse has apparently been common practice in some healthcare settings, according the the CDC. One phone call at noon on Tuesday found N95 respirator masks selling at the 7th Avenue and Fir location of Windsor Plywood for $47.50, for a box of 10 masks—with only seven boxes in stock. My first call to Home Depot resulted in a price of $13.98—apparently for one N95 mask but more checking on Wednesday found various Vancouver Home Depot locations selling three-packs of N95 respirator masks for $9.12 each. The Canadian Tire store at Cambie and 7th was selling 20-packs of N95 masks for $28.99. And Staples locations had 30-packs for $106.96 and 20-packs for $23.99. If disposable N95 respirator masks are too pricey for you, don’t bother buying anything cheaper. Paper surgical masks are only designed to stop splashes and sprays of bodily fluids and comparatively huge respiratory droplets, ranging in size from 50–100 µm. The fine particulate matter of wood smoke can waft through these masks and even the simpler gauze ones, like mosquitoes on a breeze through an open window. Spoke Thurs to binner who commutes from #DTES to collect bottles in Fairview & who has Chronic Obstructive Pulmonary Disease (COPD). He didn't want to be photographed. But told me he's coping w/ the #BCwildvire #smoke fouling #Vancouver air by pacing himself & using his inhaler. Update: While the number and severity of wildfires across the province have continued to increase—leading the B.C. government to declare a province-wide state of emergency on Wednesday (August 15)—the amount of wood smoke from wildfires fouling Vancouver’s air has decreased. As of Thursday the Air Quality Health Index was at 5 (moderate risk) and on Friday it was 3 (low risk). Click the images to enlarge them.